Edizioni Alegre, 2014, 192 pages. Amianto. Una storia operaia (Asbestos. A Working-Class Story) is written by Alberto Prunetti, an Italian writer who has published fiction and non-fiction since 2003. The book was originally published in 2012[i] and narrates the life of a factory worker, Renato Prunetti, the author’s father. Renato’s life is reconstructed from the 1960s when he started to work in his first factory, until his death, at 59, caused by an asbestos-related carcinoma in 2004. The second edition of the book integrates a debate (“Il Triello”) between the author Wu Ming 1 and the writer Girolamo De Michele, which further explores some themes of the main text. Wu Ming 1 is part of the writing collective Wu Ming, one of the major authorial voices in Italy today. De Michele, as the Wu Ming collective, has also worked both in fiction and non-fiction, and, as Prunetti, the two other participants also write in the online literary review Carmilla and come from working-class families and from environmentally problematic areas. Amianto is a hybrid text. 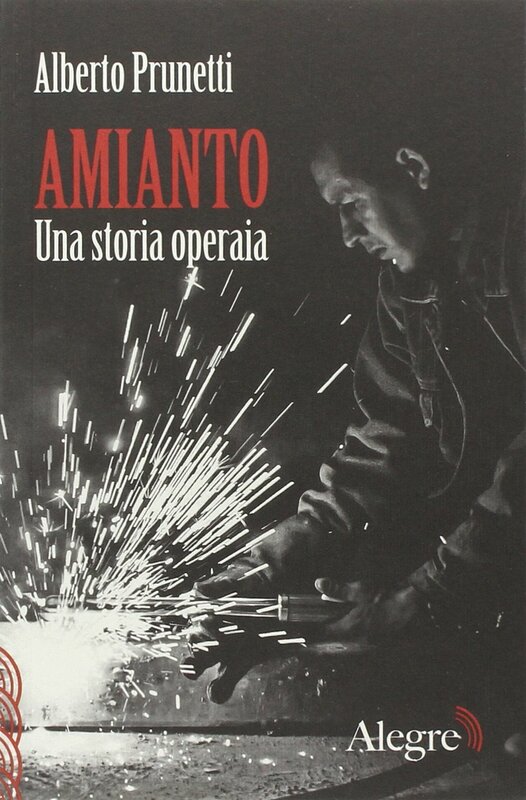 Matteo Giancotti, in a review of the book published in La Lettura, described Amianto as not a novel, nor reportage, nor a biography in its classic sense. By combining the salient aspects of the three genres, Prunetti writes a working-class story that, following the movements of the travelling factory worker Renato, retraces part of the history of the working class in Italy, from the 1970s to the end of the 1990s. Renato’s story passes through a number of important factories, most of which had a high impact both on the health of the workers and on the surrounding environment. From the Solvay (a chemical factory) that gives its name to Rosignano Solvay, in southern Tuscany, Renato passes to the nearby Solmine (another chemical factory), in Scarlino, and to the (then) Italsider (steelworks) in Piombino, before working for a long time as a travelling pipe fitter (tubista) for the Gargano company of Novara. In that role, Renato works at building, repairing and renewing industrial plants in the chemical, petrochemical and steel sectors across Italy, including the other Italsider factories and the Montedison chemical plants. At the very start of his travelling work, Renato works at a refinery near Casale Monferrato (Piedmont), the main centre of production of asbestos in Italy. In 1985 he is forced to take on false self-employment: while continuing to work exclusively for Gargano, Renato is forced to register as self-employed, renouncing a number of rights the firm would have had to assure him. One of the last passages describing the years before Renato’s retirement is set in the Busalla refinery in Liguria. At the centre of this story that crosses three decades of change in Italian industry is the body of a worker. The working biography of Renato is also the description of the deterioration of a body subject to arduous work. By narrating his father’s story, Prunetti remembers the unhealthy conditions of the work contexts: exposed to different heavy metals and other toxic substances in chemical and steel industries, dressed in asbestos gloves and overalls. The opening image of the book sees Renato working with the blowtorch – as he often did – near petrol tanks, covered by an asbestos cloth to avoid the sparks causing explosions; forced, therefore, not only to breathe the toxic substances dispersed by the blowtorch, but also the asbestos fibres. At 40, more than 20 years of work behind him, the signs of deterioration are visible. He wears a hearing aid, dentures, increasingly thick glasses – prostheses that Renato needs to “connect to the world” (p. 47). In 1998, Renato manages to retire. But the serenity is short lived. At the beginning of 2003 his health condition rapidly declines. He is hospitalized and the analyses show brain metastases caused by a lung carcinoma. The narrative rhythm intensifies, following Renato’s last months of life. The damage of the therapies and the practical and emotive difficulties linked to taking care of a gravely ill person are interwoven with Prunetti’s reflections on what brought on the death of a man of less than 60 years. The last part of the story describes the bureaucratic and judiciary experience of Renato’s family in obtaining recognition of the damage caused by the exposure to asbestos. Not surprisingly, these pages describe a slow and uninterested bureaucratic machine. First, the family has a hard time showing that Renato worked for years in contact with asbestos and other materials which caused his illness. INPS (social security) and INAIL (occupational injuries and diseases) initially deny that the exposure occurred, then argue that the exposure lasted less than the 10 years, the minimum contact period required for legally enacting special measures. Documents found between Renato’s papers – mostly pay slips and refunds of travel expenses – allowed it to be ascertained that he was exposed to asbestos for “years 15, months 9, days 21” (p. 124). The result is a small increase in his wife’s pension. But Amianto is not only the story of the worsening physical condition of Renato and the others who worked at his side. It is a story in which health is – without knowledge of the consequences or freedom of choice – exchanged for rising salaries and relatively stable working and economic conditions. But not even this exchange holds, as the rights and conditions of factory workers fall during the 1980s: Renato’s need to renounce contractual rights and guarantees and return to self-employed work is a sign of this. When the narration reaches the early 1990s, the life of Renato is seen in parallel with that of his son, the author. Alberto, able to enter a liceo – the upper stratum of the Italian high school system, rather than a technical institute – finishes high school with honours and goes on to graduate from university. This could seem like a classic social mobility story, in which the working-class parents’ labour allows their children to attain the education required to avoid heavy jobs. However, as discussed most plainly in the debate in the second edition, Renato’s expectations have not been realized. The rapid changes that characterized Italian society between the late 1980s and the 1990s have blocked much of the social mobility, as most jobs have seen declining rights and conditions. This includes many jobs that require high educational levels, a fact that frustrates intergenerational educational investment. In the debate section, Prunetti traces his own experience: college educated and specializing in the teaching of Italian, he worked as a teacher, translator and ghostwriter, without ever getting a steady job, and he alternated this work with manual labour, as in agriculture. “[A]ll this and still I cannot live above the level of poverty! Do you understand what kind of impoverishment they produced in just one generation?” (p. 148). Amianto can be read as a structural story – one in which the relations between the phenomena described are revealed in a way that goes beyond the specific context and allows the reader to understand the structural dimension (Duster, 1989). The work, which can also be read as an ethnographic account of the health and labour of factory workers, clearly shows the connections between the exploitation of the body in capitalism and the way in which this exploitation is hidden and justified. An analysis of bureaucratic language highlights this last aspect: “‘Exposed’ is a nice verb, it is a passive past participle, it does not imply an active action, a responsibility. ‘Workers are exposed…’ Nice phrase. It sounds cleaner than ‘the bosses have killed the workers’” (p. 169). This passage, from the debate that follows the original text, reminds us that the deterioration of bodily capital, to use Wacquant’s (2004) concept, is located in an economic system in which profits are based on such deterioration and the burden of costs is borne by the collectivity. Physical deterioration, risk, illness and death are not generic traits of the human experience, but are strictly linked to one’s class. The theoretical paradigm of intersectionality has urged social scientists for some years now to take into consideration how the dimensions of class, gender and race can affect people’s lives. A work like Amianto, locating class in its relation to the means of production, makes it possible to understand how a class position — in this case a working class position — can affect the life and the health of people. In the debate in the second edition, the issues of class, with reference to the specificities of the Italian case, are further analysed. The stability in employment of which the 1970s were the most solid example in Italy, are a historical exception that had already rapidly declined in the 1990s, as Alberto Prunetti’s autobiographical passages point out. The debate focuses on the impoverishment linked to precariousness. Prunetti’s attention to the impoverishment of a generation opens new questions about the changes – not for the better – of the relationship between capital, body and work. For social scientists and for those interested in a critical analysis of occupational diseases, there is much to gain in a dialogue with works like Amianto. Prunetti’s book allows us to see essential aspects of the history of the working class in Italy; it represents a detailed description and analysis of the shortcomings of the protection of workers’ health and brings to the fore important questions about the effects of the continuing intensification of precariousness on the physical and psychological well-being of workers. The strongest advantage of dealing with works that have a literary dimension, especially with quality works such as Amianto, is that the narrative element can bring about what the Russian formalists defined as the “estrangement effect”, the power to make us see in a new light something that has always been before our eyes. [i] The book was originally published in 2012 by Agenzia X; all the citations are from the 2014 Alegre edition and all the quotes – and any eventual mistake – are mine. An English translation of the last chapter of the book has been recently published by Asymptote. Duster, Troy. (1989). “The structural anecdote in social analysis.” Paper presented at the Annual Meeting of the American Sociological Association, San Francisco. Wacquant, Loïc. (2004). Body & Soul. Notebooks of an Apprentice Boxer. Oxford: Oxford University Press. Cinzia Greco is Ph.D. candidate at the École des hautes études en sciences sociales and the CERMES3 laboratory. Her doctoral research explores the way patients and doctors view and manage post-mastectomy breast reconstruction and cosmetic breast surgery in France and in Italy. In particular, she is interested in learning how gender norms influence breast cancer policies and treatments across these countries. Greco C. Alberto Prunetti’s “Amianto. Una storia operaia”. Somatosphere. 2015. Available at: http://somatosphere.net/2015/alberto-prunettis-amianto-una-storia-operaia.html/. Accessed April 18, 2019. Greco, Cinzia. 2015. Alberto Prunetti’s “Amianto. Una storia operaia”. Somatosphere. http://somatosphere.net/2015/alberto-prunettis-amianto-una-storia-operaia.html/ (accessed April 18, 2019).